Entrant must be an employee of an Elwood Staffing client at a location directly serviced by Elwood Staffing on the date Challenge winners are identified. 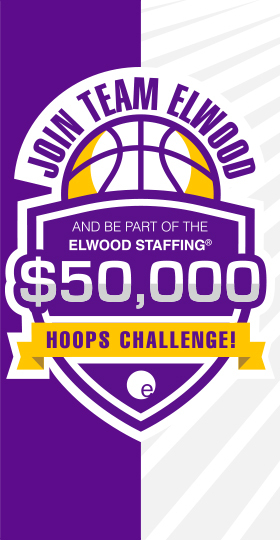 Click here to register and join the Elwood Staffing Hoops Challenge online bracket pool. After registering, you will receive an email from RunYourPool.com containing important access and contact information. Please save this email for your records. Submit a single, completed bracket with predictions for all 63 games after Selection Sunday on Sunday, March 17, 2019, and before 12:15 pm EST March 21, 2019. Predict the total combined score of the Championship Game (tiebreaker). Monitor your results and standings on the Elwood Staffing leaderboard. *See official rules for complete eligibility details. **See official rules for scoring and tiebreaker details. DESCRIPTION: The “The Elwood Staffing $50,000 Hoops Challenge” ("Challenge") is an online men’s college basketball tournament prediction Challenge. The Challenge sponsor is Elwood Staffing Services, Inc. (“Elwood Staffing”). The Challenge is not endorsed by, associated with, or sponsored by, the National Collegiate Athletic Association ("NCAA"). THIS CHALLENGE IS DEVISED AS A NON-GAMBLING PROMOTION and is intended solely for entertainment purposes. The Challenge is based on the results of the 2019 NCAA Division I Men’s College Basketball Tournament (the “Tournament”). The Tournament consists of sixty-three (63) separate games, as detailed below. An “Entrant” (as defined below) will be awarded points by correctly predicting the game winners (“Prediction”) as detailed below. Prizes will be awarded to those Entrants who have accumulated the most points during the Challenge as described below. In the event an Entrant submits a “Perfect Bracket” whereby he/she accurately predicts the outcome of all sixty-three (63) Tournament games, he/she may be eligible to win the Grand Prize. A maximum of Fifty Thousand (50,000) individual Entrants will be eligible to register for and participate in the Challenge; participation is first come, first serve and registration will close on March 21, 2019 at 12:15 p.m. Eastern Standard Time (EST) or if/when the maximum number of Entrants register. Each Entrant may submit a maximum of one (1) Challenge entry. Limit one (1) entry per person. If an Entrant exceeds the entry limitation; the Entrant will be disqualified and no prizes will be awarded to such Entrant. The Challenge “Registration Period” begins on Thursday, March 14, 2019 at 12:01 a.m. EST and ends on Thursday, March 21, 2019 at 12:15 pm EST, or if/when the maximum number of Entrants register. Entrants, based on their skill, knowledge and understanding of Tournament participants, must make their Predictions between the conclusion of the announcement of the Tournament field on March 17, 2019 and tip-off of the first game on March 21, 2019, tentatively scheduled to commence at 12:15 pm EST (the “Selection Period”). Entrants must also predict the total combined score of the Tournament championship game. This information will only be used to determine the winner in the event of a point-score tie. Failure to predict a total combined score will result in a loss of any applicable tiebreakers (as described in Section 4). ELIGIBILITY: Challenge is open only to legal United States residents residing in the fifty (50) United States and Washington D.C., who are at least eighteen (18) years of age or the age of legal majority in their state of primary residence at time of entry and (a) an employee of Elwood Staffing on the date Challenge winners are identified or (b) an employee of an Elwood Staffing client at a location directly serviced by Elwood Staffing on the date Challenge winners are identified (“Entrant”). Each Entrant must be the rightful owner of the e-mail address identified in the Entrant's entry at the time of registration. In the event of a dispute as to the identity of a winner, the winner will be deemed the person in whose name the email account was opened. Challenge void where prohibited. If you are a college athlete or expect to be one, participating in this Challenge could affect your NCAA eligibility. Shareholders of Elwood Staffing and their immediate family members are not eligible to win. All winners must be employed by a client company location currently served by Elwood Staffing or be actively working as a temporary associate at an Elwood Staffing client company or be actively employed as an Elwood Staffing corporate/internal employee. HOW TO REGISTER AND SELECT PICKS: Entrants must register and make their selections through a third-party administration website (RunYourPool.com) accessible via www.elwoodstaffing.com/hoops. Once registered, Entrants must predict one (1) winner for each game in the Tournament. Elwood Staffing may send reminder emails during the Selection Period to Entrants who have registered to participate but haven’t yet submitted complete Predictions. The Entrant will make the Prediction by clicking on the team name they believe will advance to the next round of the Tournament. After completing Predictions, Entrants will then be asked to enter their best guess for the total combined score of the Tournament championship game (“Tiebreaker”). The Tiebreaker answers will ONLY be used to determine prize winners in the event that there is more than one (1) Perfect Bracket, OR a tie in final points awarded for any tied, non-Perfect Brackets. The Tiebreaker criteria will be applicable for all prize levels, including the Grand Prize (as defined in Section 6). After completing the Predictions and entering an answer for the Tiebreaker, Entrants must confirm that they have read, understand and agree to these Official Rules and click the “Submit” button on the form to register the entry. If Entrant does not submit the entry form, the entry will not be valid. If Entrants wish to make changes to their selections, they may go back and change a selection at anytime during the Selection Period. No changes or revisions to the Predictions will be permitted after the close of the Selection Period. Incomplete or unintelligible entries will be disqualified. All information provided by Entrant becomes the property of Elwood Staffing. ELIGIBLE ENTRANTS MUST SUBMIT IN ACCORDANCE WITH THESE OFFICIAL RULES. NO OTHER METHOD OF SUBMISSION WILL BE ACCEPTED. Tiebreaker #3 - Random drawing to select final winners among group of remaining tied Entrants. WINNER SELECTION AND NOTIFICATION: The Grand Prize will only be awarded in the event that an Entrant submits a Perfect Bracket. In the event no Entrant has submitted a Perfect Bracket, the five (5) Entrants with the highest point totals at the end of the Challenge (or tiebreaker, if applicable) will be declared the Points Prize winners, pending eligibility verification. Potential winners will be notified via email at the email address listed in their Challenge Registration on or about April 10, 2019. Selected winners will be required to respond (as directed) to the notification within seventy-two (72) hours of first attempted notification. The failure to respond timely to the notification may result in forfeiture of the prize. Grand and Points Prize winners will be required to verify eligibility and identification to Elwood Staffing and to execute a liability release and, unless prohibited by law, a publicity release (collectively, the “Prize Claim Documents”) covering eligibility, liability, advertising, publicity and media appearance issues, unless prohibited by law. The Grand and Points Prize winners must provide Elwood Staffing with a valid social security number for tax reporting purposes before the prize will be awarded. An IRS Form 1099 will be issued in the name of the Grand and First Prize winners and winners will be solely responsible for any and all taxes. The failure of any winner to respond timely to the notification may result in forfeiture of the prize in Elwood Staffing’s sole discretion and, in such case, Elwood Staffing may re-award the prize to an alternate winner according to point scores. Prizes will not be awarded until all such Prize Claim Documents are returned to Elwood Staffing. Grand Prize - Perfect Bracket ONLY The Grand Prize will only be awarded in the event that an Entrant submits a Perfect Bracket. If no Entrant submits a Perfect Bracket the Grand Prize will not be awarded. One (1) Grand Prize winner shall win $50,000. Points Prize – Highest Point Total The five (5) Entrants with the highest point totals at the end of the Challenge who have not submitted a Perfect Bracket shall receive the Points Prize. The Points Prize winners will receive Five Hundred Dollars ($500) in the form of a check. Limit one (1) prize per Entrant. ALL FEDERAL, STATE AND LOCAL TAXES, AND ANY OTHER COSTS AND EXPENSES, OF WHATEVER NATURE, ASSOCIATED WITH THE RECEIPT OR USE OF ANY PRIZE ARE THE SOLE RESPONSIBILITY OF THE WINNER. Prize winners cannot assign or transfer any prize to another person. No prize substitution is allowed except in the sole discretion of Elwood Staffing. The prizes are awarded WITHOUT WARRANTY OF ANY KIND, express or implied, without limitation. If prizes are awarded but unclaimed/forfeited by recipient, prize may not be re-awarded, in Elwood Staffing sole discretion. CONDITIONS OF PARTICIPATION/RELEASES: Challenge is void where prohibited or restricted by law. All federal, state, and local laws and regulations apply. By participating, each Entrant agrees to be bound by these Official Rules and the decisions of Elwood Staffing, which shall be final in all respects. By participating in this Challenge and/or by accepting any prize, each Entrant agrees to release and indemnify Elwood Staffing from any and all actions, claims, injury, loss or damage arising in any manner, directly or indirectly, from participation in this Challenge and/or acceptance, use, or misuse of any prize. Acceptance of a prize authorizes Elwood Staffing and its assigns to use a winner’s name, voice, likeness, biographical data, city and state of residence and entry materials in programming or promotional material, throughout the universe in perpetuity, or on a winner's list, if applicable, without further compensation unless prohibited by law. Elwood Staffing is not obligated to use any of the above-mentioned information or materials, but may do so and may edit such information or materials, at Elwood Staffing’s sole discretion, without further obligation or compensation. By entering the Challenge, Entrants agree that: (1) any and all disputes, claims, and causes of action arising out of or connected with the Challenge, or any prizes awarded, shall be resolved individually, without resort to any form of class action; (2) any and all claims, judgments and awards shall be limited to actual out-of-pocket costs incurred, including costs associated with entering the Challenge, but in no event will Entrant’s attorneys’ fees be awarded or recoverable; and (3) under no circumstances will any Entrant be permitted to obtain any award for, and Entrant hereby knowingly and expressly waives all rights to seek, punitive, incidental or consequential damages and/or any other damages, other than actual out-of-pocket expenses, and/or any and all rights to have damages multiplied or otherwise increased. Elwood Staffing, its employees, agents, representatives and assigns (“Released Parties”) shall not be liable for: (i) late, lost, delayed, stolen, misdirected, postage-due, incomplete, unreadable, inaccurate, garbled or unintelligible entries or communications, regardless of the method of transmission; (ii) telephone system, telephone or computer hardware, software or other technical or computer malfunctions, lost connections, disconnections, delays or transmission errors; (iii) data corruption, theft, destruction, unauthorized access to or alteration of entry or other materials; (iv) any injuries, losses or damages of any kind caused by the prize or resulting from acceptance, possession, use or misuse of a prize, or from participation in the Challenge; (v) an Entrant’s claim that he or she has somehow been defamed or portrayed in a false light or (vi) any printing, typographical, human administrative or technological errors in any materials associated with the Challenge. Released Parties assume no responsibility for any damage to an Entrant’s computer system, which is occasioned by accessing the Website, or participating in the Challenge, or for any computer system, phone line, hardware, software or program malfunctions, or other errors, failures, delayed computer transmissions or network connections that are human or technical in nature, or for the incorrect or inaccurate capture of information, or the failure to capture any information. Released Parties reserve the right, in their sole discretion, to cancel, modify or suspend the Challenge (or any portion of the Challenge) should a virus, bug, computer problem, unauthorized intervention or other cause or problem corrupt or inhibit the administration, security or proper play of the Challenge and, in such situation, to select the winner(s) from eligible non-suspect entries received prior to and/or after such action or in such manner as deemed fair and appropriate by Elwood Staffing. Elwood Staffing may prohibit you from participating in the Challenge or winning a prize if, in their sole discretion, they determine you are attempting to undermine the legitimate operation of the Challenge by cheating, hacking, deception, or any other unfair playing practices of intending to annoy, abuse, threaten or harass any other Entrants or Elwood Staffing representatives. CAUTION: ANY ATTEMPT TO DELIBERATELY DAMAGE THE WEBSITE OR UNDERMINE THE LEGITIMATE OPERATION OF THE CHALLENGE MAY BE IN VIOLATION OF CRIMINAL AND CIVIL LAWS AND WILL RESULT IN DISQUALIFICATION FROM PARTICIPATION IN THE CHALLENGE. SHOULD SUCH AN ATTEMPT BE MADE, ELWOOD STAFFING RESERVES THE RIGHT TO SEEK REMEDIES AND DAMAGES (INCLUDING ATTORNEY FEES) TO THE FULLEST EXTENT OF THE LAW, INCLUDING CRIMINAL PROSECUTION. GOVERNING LAW: ALL ISSUES AND QUESTIONS CONCERNING THE CONSTRUCTION, VALIDITY, INTERPRETATION AND ENFORCEABILITY OF THESE OFFICIAL RULES, OR THE RIGHTS AND OBLIGATIONS OF ENTRANTS OR THE RELEASED PARTIES IN CONNECTION WITH THE CHALLENGE OR IN CONNECTION WITH ANY SUBMISSION OR OTHER MATERIAL SUBMITTED IN CONNECTION WITH THE CHALLENGE, SHALL BE GOVERNED BY AND CONSTRUED IN ACCORDANCE WITH THE INTERNAL LAWS OF THE STATE OF INDIANA WITHOUT GIVING EFFECT TO ANY CHOICE OF LAW OF CONFLICT OF LAW RULES OR PROVISIONS THAT WOULD CAUSE THE APPLICATION OF ANY OTHER STATE’S LAWS. THE INVALIDITY OR UNENFORCEABILITY OF ANY PROVISION OF THESE RULES SHALL NOT AFFECT THE VALIDITY OR ENFORCEABILITY OF ANY OTHER PROVISION. IN THE EVENT THAT ANY PROVISION IS DETERMINED TO BE INVALID OR OTHERWISE UNENFORCEABLE OR ILLEGAL, THESE RULES SHALL OTHERWISE REMAIN IN EFFECT AND SHALL BE CONSTRUED IN ACCORDANCE WITH THEIR TERMS AS IF THE INVALID OR ILLEGAL PROVISION WERE NOT CONTAINED HEREIN. IN NO EVENT WILL THE RELEASED PARTIES BE RESPONSIBLE OR LIABLE FOR ANY DAMAGES OR LOSSES OF ANY KIND, INCLUDING DIRECT, INDIRECT, INCIDENTAL, CONSEQUENTIAL OR PUNITIVE DAMAGES ARISING OUT OF ENTRANT’S PARTICIPATION IN THE CHALLENGE. WITHOUT LIMITING THE FOREGOING, ALL PRIZES, THE CHALLENGE AND THE WEBSITE ARE PROVIDED “AS IS,” WITHOUT WARRANTY OF ANY KIND, EITHER EXPRESS OR IMPLIED, AND THE RELEASED PARTIES HEREBY EXPRESSLY DISCLAIM ALL IMPLIED WARRANTIES, INCLUDING, BUT NOT LIMITED TO, IMPLIED WARRANTIES OF MERCHANTABILITY, FITNESS FOR A PARTICULAR PURPOSE OR NON-INFRINGEMENT. SOME JURISDICTIONS MAY NOT ALLOW LIMITATIONS OR EXCLUSION OF LIABILITY FOR INCIDENTAL OR CONSEQUENTIAL DAMAGES OR EXCLUSION OF IMPLIED WARRANTIES, SO SOME OF THE ABOVE LIMITATIONS OR EXCLUSIONS MAY NOT APPLY TO YOU. CHECK YOUR LOCAL LAWS FOR ANY RESTRICTIONS OR LIMITATIONS REGARDING THESE LIMITATIONS OR EXCLUSIONS. CAUTION: ANY ATTEMPT TO DELIBERATELY DAMAGE OR UNDERMINE THE LEGITIMATE OPERATION OF THE CHALLENGE MAY BE A VIOLATION OF CRIMINAL AND CIVIL LAWS AND SHOULD SUCH AN ATTEMPT BE MADE, THE RIGHT IS RESERVED TO SEEK DAMAGES TO THE FULLEST EXTENT OF THE LAW. GAMBLING PROHIBITION: This Challenge is strictly for entertainment purposes and may not be used in connection with any form of gambling.